It’s hard to believe that we’re almost to Chinese New Year’s Day again. The year slipped by so quickly! I hope you all had a productive and prosperous year of the Rooster. It was a wonderful year for me, as you might have noticed on my books tab: the third book in my Mei-hua trilogy, Trapped, was nominated for an Agatha Award and for a Silver Falchion Award. Both are great honors. While I don’t know everything this new year of the Dog will bring, one thing for sure is that I am coming out with a new early Ming Dynasty series. 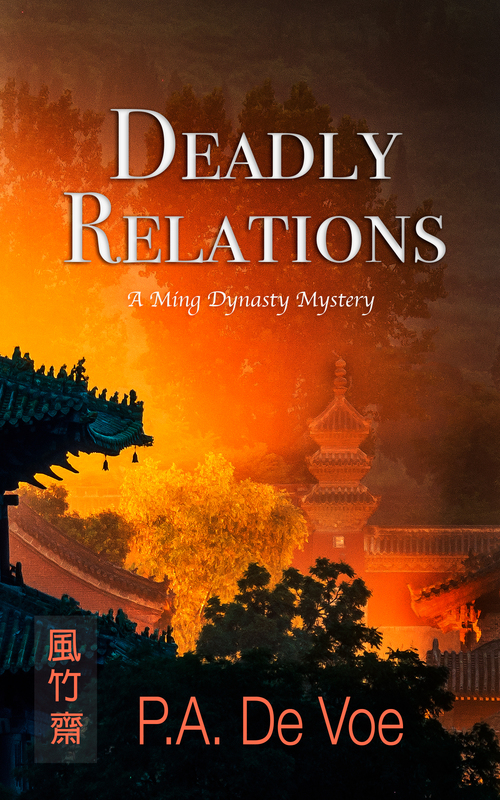 The first novel is Deadly Relations. Names are more than arbitrary, random words used to identify individuals. The surnames can, and often do, indicate family relationships. The given names, although they can be arbitrary, also often indicate something about the parents’ wishes for and/or perceptions of their child. In China today, 100 surnames dominate: making up 85% of the country’s total surnames. And remember, China has about 1.4 billion people. Compare this to the US where, according to the 2000 census, 151,00+ surnames make up only 3% of our population’s surnames! Think about how you feel when you meet someone with your same last name. There is a sense of connection. The same is true in China—although the connection may go back hundreds of years. Traditionally and today, the Chinese put the family name (the surname) first and then the given name (personal name) second. So that, if a person is named Liu Xiao-lung à Liu is the family name and Xiao-lung is his personal name. In the United States, we would refer to this person as Xiao-lung Liu, putting the family name last. One way to figure this out, when you’re not sure, is to remember that in most cases the family name is one word. 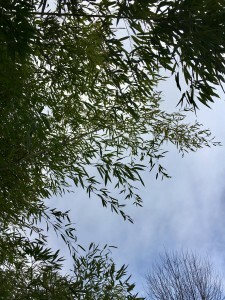 Often, although not always, the given name is two words—and usually NOT written with a – between the words, the way I have written Xiao-lung in this post. What’s interesting about Chinese given names is that they often carry the hopes parents have for their children. The names are meaningful. Xiao-lung means Little Dragon and, therefore, symbolizes good fortune and success. Boy’s names are likely to reflect strength, good fortune, and whatever aspirations the parents have for him, for example, in intelligence or business success. For girls’ names, traditional parents may give their child a name which reflects a desire for her to be lovely in appearance or have a sweet, peaceful demeanor. For example, Xiang-lian would mean Fragrant Lotus Flower. This is changing for women today, however. I had a female friend whose given name was Xue-wen, Studies Literature (in the past, this was more of a boy’s name). And, indeed, she did have strong academic interests and abilities. Therefore, as with names in the West, there are gender preferences. Xiang-lian is not a name a parent would give a boy, nor would Xiao-lung be given to a girl. No more than a typical American would name their girl child Stephen or the boy child Mary. What about your name? What does it say about you and your family? What was it like to live in 1380 China? What did people do? How did they travel, dress, or eat? Where did they live? 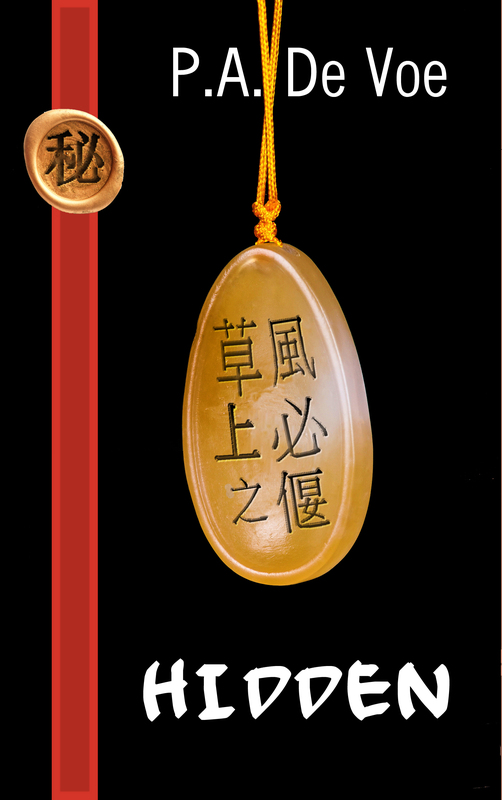 Hidden, the first adventure/mystery novel in my Ancient China trilogy, takes you back and plops you down in the middle of this fascinating time. Hidden is the story of a young, bi-racial heroine who finds her world turned up-side-down when her father, a magistrate, is threatened by enemies who are trying to accuse him of treason. Treason was considered the worst of all crimes because it was an act against the Emperor himself. If found guilty, the punishment included death or—if you were lucky—banishment to the farthest corners of the empire and social ostracism for not only her father but for every member of his own and his extended family. To protect Mei-hua, her father sends her away to live with a friend in Hangzhou City. 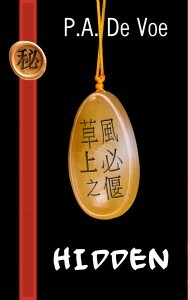 On the way there, Mei-hua is captured and sold as an indentured servant to a wealthy family. She must hide her identity in order to avoid the authorities and her father’s enemies. Will she be able to free herself and find her father’s friend and safety? 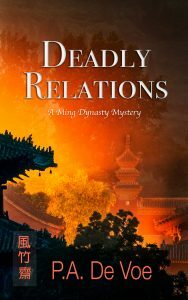 This is a story of survival and discovering the meaning of family, friendship and loyalty set in the intriguing and dangerous world of Ancient China. For the history buffs among you, there is an Author’s Note section at the end of Hidden with more information on the culture of Mei-hua’s Ancient China. You can find Hidden by searching under PA De Voe on Amazon or going to http://www.amazon.com/s/ref=nb_sb_noss?url=search-alias%3Dstripbooks&field-keywords=pa+de+voe. I can hardly believe it’s April already. Tomorrow, April 5th, is Qing Ming, a special day for every family of Chinese descent. While Qing Ming literally means Clear and Bright in English, the day is also known as: All Souls Day, Grave Sweeping Day, Tomb Sweeping Day, and Chinese Memorial Day. 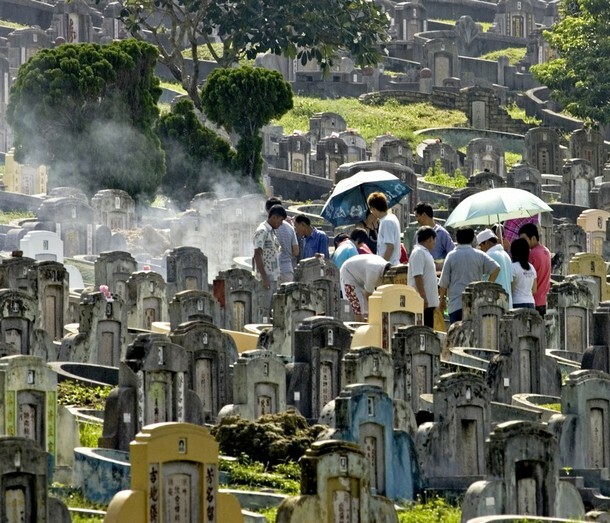 Qing Ming day is a special time when families show respect and honor to their ancestors by gathering together to tend their graves. 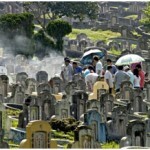 The family takes special foods, tea, and other grave goods (such as spirit money) to offer the dead at their grave. This is done because, traditionally, the departed live in a world where they still have needs. They need money, food, items for comfortable living. 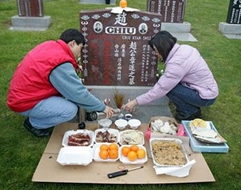 Once everything is officially offered up to the ancestors, the family picnics at the grave site. As we know, sharing food is an important way to show solidarity, togetherness. Thus, Qing Ming does double duty by bringing the family together to honor the dead and to strengthen family ties among the living. 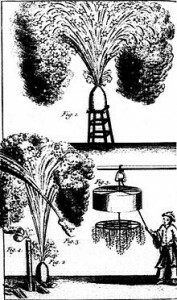 It may surprise people that, as noted in the previous post, the Chinese invention of gunpowder (or really protogunpowder) is attributed to a monk. However, as with many inventions, there is an element of serendipity at play here. Monks, Taoist priests, and alchemists in general used the ingredients which make up gunpowder for other purposes, in particular, as medicines and elixirs of immortality. They were not looking for explosives; they were looking for ways of prolonging life. However, when these specialists mixed certain ingredients together, they sometimes got an entirely different result then intended! The author of a 9th century text warned Taoists looking for an immortality elixir to be careful when mixing sulphur, arsenic sulphide, and saltpetre because it could badly burn them and even burn down their buildings! Needham (p 31) says this is the first reference to protogunpowder. It does not take a big jump in thinking to move from accidental explosions to controlled explosions. And it makes sense that it would be among the monks, Taoist priests, and alchemists who would do this and not someone from the military. Originally, these explosions weren’t harmful, just exciting and noisy. 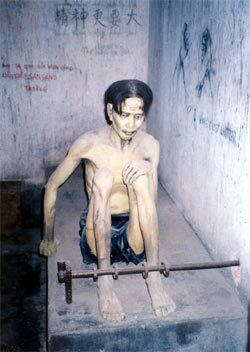 They were used to scare off ghosts and evil spirits and in celebrations. However, as so often happens with inventions, the relatively harmless rocket that had explosive materials in it was soon turned into a bomb as well. From the 11th and into the 13th century Chinese bombs were like rockets—in that they weren’t really very destructive because the proportion of nitrate was low. As I mentioned above, Needham refers to these early forms as protogunpowder bombs. At most they would explode with a “whoosh,” much like the rockets they were based on—frightening, but not very destructive. However, as the percent of nitrate was increased the bombs became serious weapons which were able to blow up walls and city gates. 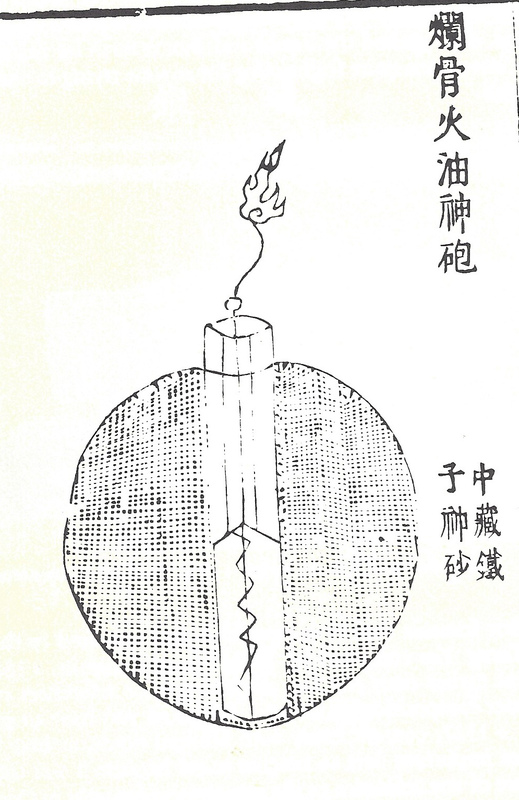 By the Ming Dynasty in the 14th century, such fragmentation bombs (as that shown at the top of this post) were filled with iron pellets and pieces of broken porcelain. 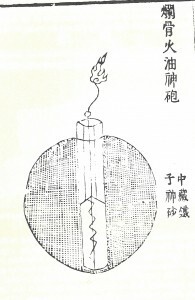 This bomb was used in war and was designed to mutilate enemy soldiers (from Huo-long-jing, a Ming Dynasty text, part 1, chapter 2 from en.wikipedia.org). What a long journey for these materials–to go from a hopeful immortality elixir to a source of mutilation and destruction! 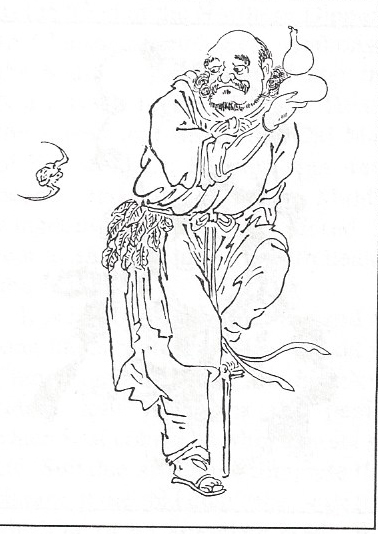 Lán Cǎi-hé (also written as Lán Ts’ǎi-hó) 藍采和 exemplifies one of the 8 Immortals. Lán Cǎi-hé is thought to have been a real person, but one whose behavior and life-style was outside the ordinary. Lan can be portrayed as a woman or a man; Eberhard refers to her/him as an hermaphrodite. Not much is known about Lán Cǎi-hé’s 藍采和 origin, although she may have lived during the Five Dynasties period (907-960) (Wong p. 32). She dressed in colorful rags, was often shown wearing only one shoe with the other foot bare. In the summer her garments were quilted or stuffed with cotton and wool; in the winter she had only a thin gown. Around her waist she wore a 3 inch wide sash made up of pieces of wood. She carried a basket of peaches or flowers and often wore flowers in her hair. She begged in the markets by clapping 3 foot long castanets. Sometimes she was seen with a flute. As a holy fool, she wandered around as a street musician, chronically drunk, singing and joking with people in the markets. She gave what little money she had (after drinking her fill) to the poor. Lai in his small, but charming book The Eight Immortals, noted that Lán Cǎi-hé was a humorist who “could make people laugh till they rolled on the ground” (p. 5). Her songs, although often largely unintelligible, were about the vanity of life, and about immortality and life in the immortal lands; they also foretold the future. She became a part of the 8 Immortals group when she met Lü Tung-pin and Chung-li Ch’uan (both a part of the 8 Immortals group) while traveling through the land of the immortals. 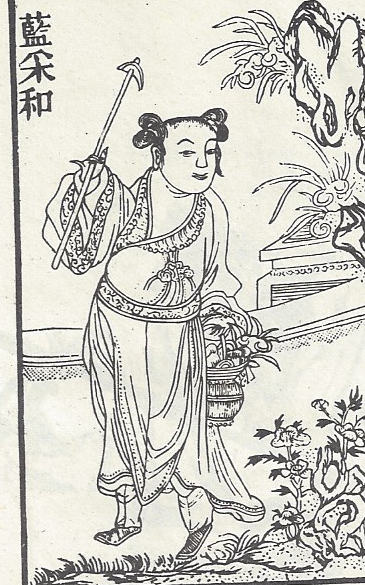 Lü and Ch’uan were captivated by her carefree manner and beautiful voice and invited her to join them (Wong p. 32). The Land of the Dragon, Chinese Myth gives another version: she passed out drunk in a tavern in Anhui and was taken to the land of the Immortals. The only things left behind were her one shoe, robe, belt and musical instruments (p. 111). This latter version just proves that goodness and spirituality don’t have to equate to perfection or rigid social norms! 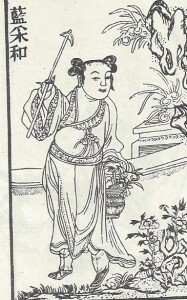 Lán Cǎi-hé 藍采和 is the patron of minstrels. References: Eberhard; Bartholomew; Eva Wong; Land of the Dragon, Chinese Myth; T.C. 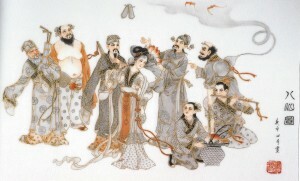 Lai The Eight Immortals. As a part of the traditional Chinese spiritual world there is a group called Immortals. 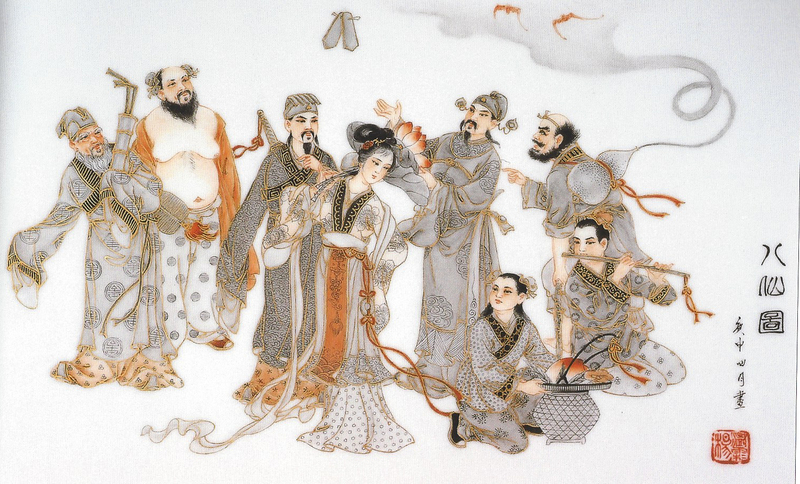 No matter whether they are male or female, young or old, the immortals are usually worshiped as gods of longevity. Veitnamese and Chinese New Year celebrations remind us of the many Asian Americans we have in the U.S. 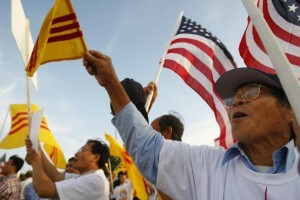 The Vietnamese Americans are the fourth largest Asian group in the US (Chinese, Asian Indian, and Filipino are the top three). Their mass migration started after 1975 at the end of the Vietnamese War. At that time, people were fleeing Vietnam as refugees and came to the US with little material resources, although a strong ethic and desire for education and for their family to succeed. They left their homeland under duress. If they had stayed, they or their loved ones (father, mother, brother, sister) would have become a political prisoner, perhaps tortured and killed. They had little choice. Once here, however, they have embraced the US as their new homeland, with the intent to stay. They have assimilated politically, economically, even culturally. At the same time, remembering their roots and valuing their own ethnic traditions are an important underpinning of their communities and families. While the first generation is not as wealthy on average as the first generation economically motivated Chinese immigrants (remember, most refugees come with little to no resources—no matter what their social and economic status was at home), they have poured their commitment into their children and their children’s success. Today, many second generation Vietnamese have completed college, become professionals, and can be considered successful in the US society. The Chinese Americans are the largest, and certainly among the oldest Asian ethnic groups we have. [Note: I am using Asian as the US Census does: people with origins in the Far East, Southeast Asia, or the Indian subcontinent.] San Francisco’s Chinatown, which was established in the 1840s, is the oldest Chinatown in the US and has the highest density of Chinese-American residents. Most of these are, or were originally, from Guangdong province and Hong Kong and, therefore, are Cantonese speakers—Remember when I greeted you last week with Gong Hei Fat Choi! for Happy New Year? The reason is because historically most of our Chinese immigrants came from these southern areas; areas that have a long tradition of migrating out of their country for jobs and other economic opportunities. (Note: this includes other Chinese languages, but I’m using Cantonese as a catch-all for the Yue language branch of Chinese.) In the past, mostly men came and stayed in their new host country in order to make a living and send money home. Some of these men returned to their home areas periodically to take a wife, who may have remained in his home village living with his parents, or (once our immigration laws changed) brought them to the US to live. In the last 10 to 20 years or so, more and more of our Chinese immigrants from mainland China are Mandarin speakers. This is bringing a change within the Chinese-American communities in terms of language use. Mandarin apparently is taking over as the lingua franca of the American Chinese diaspora. However, I must say that when I overhear a group of Chinese at a University or in a large, mixed group setting speaking with each other, they use English. Perhaps English is considered a “neutral” third language for them—one which doesn’t privilege any one of the various Chinese languages over another. Not to mention the fact that it is also the common language of the US and they all are adept at its use. In terms of modern immigration, more and more mainland Chinese are emigrating to the US through the EB-5 Investment Visa, which allows powerful, wealthy Chinese access to US citizenship. Under the EB-5 Visa, established in 1990 (under the first President Bush), a green card is given with the right to permanent US residency in certain US states. This type of Visa is given to those who invest at least US$500,000 in projects listed by the United States Citizenship and Immigration Servies (USCIS) (http://www.uscis.gov/working-united-states/permanent-workers/employment-based-immigration-fifth-preference-eb-5/eb-5-immigrant-investor). Naturally, the Chinese and Vietnamese Americans will be found at all levels of the U.S. socio-economic ladder but, overall, both of these immigrant groups have contributed quite a bit to our country. Personally, I am happy with the diversity they’ve added to our cultural understanding, yes, but (I’m being VERY selfish here) they’ve each (as with other Asian cultures) brought wonderful variety to our food cuisine! I love American comfort foods, but who can resist the flavors and textures of these “new” dishes?! If you’re interested in learning more, go on the Internet and type in foods from whatever country intrigues you—you will have a bountiful harvest! To check on how many people are in each ethnic group in the US go to: http://www.census.gov/. You can get 2013 data as well—in some areas. A site where delicious recipes are generously shared is: http://rasamalaysia.com/. A good paper on Vietnamese in the US today is at: http://www.bpsos.org/mainsite/images/DelawareValley/community_profile/us.census.2010.the%20vietnamese%20population_july%202.2011.pdf. For a quick overview of Chinese in the US see: http://en.wikipedia.org/wiki/Chinese_American#Statistics_of_the_Chinese_population_in_the_United_States_.281840.E2.80.93present.29. What would we do without umbrellas? Pam on CHINESE NEW YEAR 2017, WHAT DO PEOPLE DO BESIDES EAT? john on CHINESE NEW YEAR 2017, WHAT DO PEOPLE DO BESIDES EAT? Discover the fascinating world of traditional China! Tony Allan & Charles Phillips. Land of the Dragon, Chinese Myth. Terese Tse Bartholomew. Hidden Meanings in Chinese Art. Wolfram Eberhard. A Dictionary of Chinese Symbols.